Did you know? One handful of good garden soil can contain more organisms than the number of human beings who have ever lived! The local flower movement is riding quickly on the heals of the local food movement. Here at Persephone we’re passionate about fresh flowers! 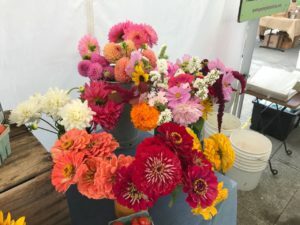 We grow dozens of varieties including many herbs, bulbs, greens, ornamental grasses and old fashioned favorites like sweet peas, dahlias, daffodils and sunflowers. We arrange them for weddings, bunch them for the farmer’s market, offer them in our CSA boxes and provide them by the bucket for DIY fun! It’s exciting to see horizons expanding. Customers are asking for more than the tired predictable blooms flown in from Colombia and Ecuador, flowers whose backstory is something we’d rather not think about. The first thing we naturally want to do when we pick up a flower is to stick our nose in and take a big whiff. But sticking your nose into a scent-less, chemically processed rose which might last for a week on your table, but without much heart, can be pretty unsatisfying. You even question at the end of the week: should I add this to my compost pile? PLEASE, DON’T FEEL GUILTY ABOUT TREATING YOURSELF TO FLOWERS! Flowers provide nectar and pollen for bees and other pollinators. Our precious bees need all the help they can get. The fact that we don’t use chemicals on our plants make them an excellent food source for all sorts of beneficial insects we rely on to help with the checks and balances of keeping our crops pest-free. Having lots of flowers in our fields also helps tremendously in our crop rotations. Disease cycles build up in the soil when a relatively small representation of vegetable plant families are grown season after season. Inserting the huge diversity of flower varieties into the mix has noticeably helped give our soil a break.